Combine turkey, melty cheese, spinach and more on crunchy Italian bread for this panini. 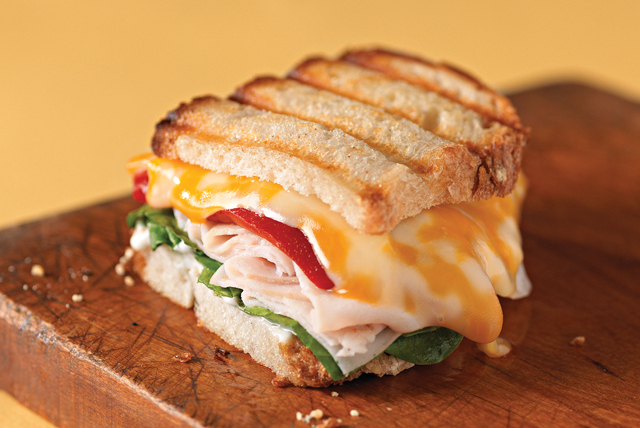 This Panini with Turkey and Cheese is a bistro favorite. Spread 1 bread slice with mayo. Fill both bread slices with all remaining ingredients except oil. Brush outside of sandwich with oil. Grill 2 to 3 min. or until sandwich is golden brown and cheese is melted. Serve with smart sides, such as a piece of fruit and assorted cut-up fresh vegetables. Heat skillet on medium heat. Cook sandwich 3 min. on each side or until cheese is melted and sandwich is golden brown on both sides, gently pressing down top of sandwich with spatula to flatten slightly as it cooks.